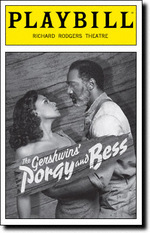 George and Ira's Gershwin's ground-breaking work, reimagined by director Diane Paulus, musician Dierdre Murray and playwright Suzan-Lori Parks, stars Audra McDonald, Norm Lewis and David Alan Grier. A two-and-a-half hour reworking of George and Ira Gershwin's folk opera about the crippled Porgy and his love for seductress Bess that leads him to a confrontation with her murderous boyfriend, Crown, in 1920's Charleston, SC. Includes classic songs "Summertime," "Bess, You Is My Woman Now," "I Got Plenty O' Nuttin'" and "I'm on My Way."